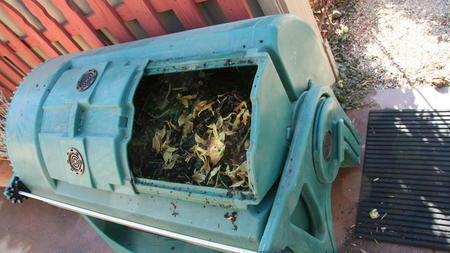 Backyard composting is one of the most rewarding aspects to gardening. It plugs you right into the cycle of life, transforming garden debris into gold. I also recommend checking out any of the composting techniques at Instructables (this is a fantastic DIY website, by the way). Composting goes in and out of style in the test garden, depending on what we’re working on and how much space we have. I am currently testing out the Sun-Mar 400. Though I am more of a purist when it comes to compost (preferring to build a pile on the ground and turn it by hand), I am rising above my skepticism to give this above-ground tumbler a fair shot. The idea is that you feed it yard scraps, pour a diluted microbialsolution in it (an 8oz. bottle of Compost Swift is included in purchase), turn it often, and harvest finished compost out of thecenter chamber. I love building a bicep rather than breaking my back, but I’m not having great luck with perfectly finished compost coming through the center chamber, as is pictured above (photo not taken in our garden). My chamber spits out a mix of compost and yet-to-decompose yard waste. Supposedly it can take some time to start working properly. I will keep you posted.